The UK government has given the go-ahead for the French and Chinese financed nuclear power station at Hinkley Point in Somerset. Approval for the project comes with some new conditions attached, including a provision that the UK government has to be consulted if EDF, the French company behind the project, wants to sell its controlling stake. The proposed new plant, known as Hinkley Point C, will be built next to two existing facilities, Hinkley Point A and B, and is set to begin generating electricity in 2025. But critics are still warning against escalating costs and the implications of nuclear power plants being built in the UK by foreign governments. What are the arguments for Hinkley Point C? Companies and governments want Hinkley Point C to be built. For the UK, it will deliver 7% of our electricity when most other nuclear power stations will have closed down. The low-carbon electricity will help towards our climate goals. The huge project will provide an economic stimulus. And the funding arrangements mean the cost will not end up on the government's books. The French want it built because it furthers their international nuclear ambitions. Despite setbacks in projects in Finland and Flamanville in northern France, Hinkley provides a showcase to export their reactor technology around the world. The Chinese, via the CGN group, have committed to one-third of the £18bn cost, in order to get a foothold in Western Europe. The Hinkley deal also involves the Chinese taking a stake in a new project at Sizewell and the possibility of building their own reactors at Bradwell in Essex. How big is the project and what will it cost? 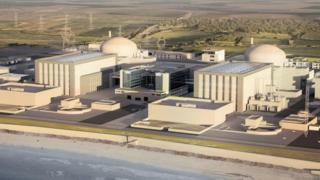 Hinkley Point C will be the biggest construction site in Europe, according to EDF. The construction will provide 25,000 jobs. At its peak, 5,600 people will work on site. The finished power plant will employ 900 people. The upfront cost for EDF and its partner over the coming years will be £18bn. But in return, EDF will receive a guaranteed price for Hinkley's electricity for 35 years. A complex subsidy arrangement will see consumers pay billions. EDF's expected return on its investment is set to be between 9% and 10%. What will it mean for consumers? EDF's contract with the government guarantees the firm a "strike price" of £92.50 per megawatt hour (Mwh) for the electricity that Hinkley Point C generates. If the wholesale price of power is lower than this set price, consumers make up the difference. But the government now expects future wholesale electricity prices to be lower than it forecast when it agreed the strike price in 2013. The National Audit Office says that as a result, the expected top-up payment by consumers has increased from £6.1bn to £29.7bn. Why is the UK keen on new nuclear? Ever since Tony Blair committed the UK to new nuclear in 2006, successive governments have argued that nuclear power is necessary as part of our generation mix. Having new nuclear - it is argued - makes the UK less reliant on imported energy. Nuclear also delivers base load electricity - that is, the amount of power that is needed to satisfy minimum demand - because it is always available. That's important as more intermittent renewables - such as wind and solar power - come on to the grid. French energy giant EDF is leading the project. It's 85%-owned by the French state. French nuclear firm Areva, which is also majority state-owned, is supplying the EPR reactor technology that will be used at Hinkley Point C.
But EDF is now in effect buying the reactor from itself. Following years of losses, Areva's reactor unit is being merged with EDF as part of a rescue plan orchestrated by the French government. China's CGN has a 33.5% stake in Hinkley Point C and will have to fund a third of the £18bn cost. But 60% of the construction value will flow to UK firms. EDF's UK boss originally said that he expected Britons to cook their Christmas turkeys with power from Hinkley Point C by 2017. But the project has been hit by a series of setbacks and delays. Concerns have grown over Areva's EPR reactor, the type to be used at Hinkley. It's technically complex and has proved difficult to construct: EDF's Flamanville project in Northern France is three times over budget and years behind schedule. As the cost of Hinkley escalated, EDF had to find a partner to share the financial burden. Falling power prices then hit EDF's revenues. Its finances were further shaken by mounting liabilities, due to the roll-out of smart meters and the upgrading of France's nuclear power capability. Opposition from French trade unions, which wanted Hinkley Point C delayed, also forced the company to conduct a lengthy consultation with its works council to avoid a legal challenge. EDF shareholders eventually agreed a French government-backed refinancing plan, paving the way for their decision to go ahead with the project. Then, in July, when the UK government was expected to sign the deal, the Business Secretary, Greg Clark, announced there would be a review. If construction begins now, Hinkley could begin generating electricity for the UK market by 2025.